The Toledo History Museum houses an extensive collection of objects, photographs and archival materials from all periods of Toledo's history. Our collections range from textiles and period clothing to household goods, transportation examples, and industrial tools. 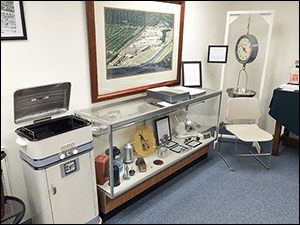 These items reveal the stories of the many individuals, families and businesses that have had past or present connections to our area. Our collections are available to visitors and researchers during museum hours, Saturdays from 12 to 5 pm and Sundays from 1 pm to 5 pm and by appointment. Do You Have an Item to Donate to the Toledo History Museum?